As a business, Snooze has over 90 stores across Australia including their online store. 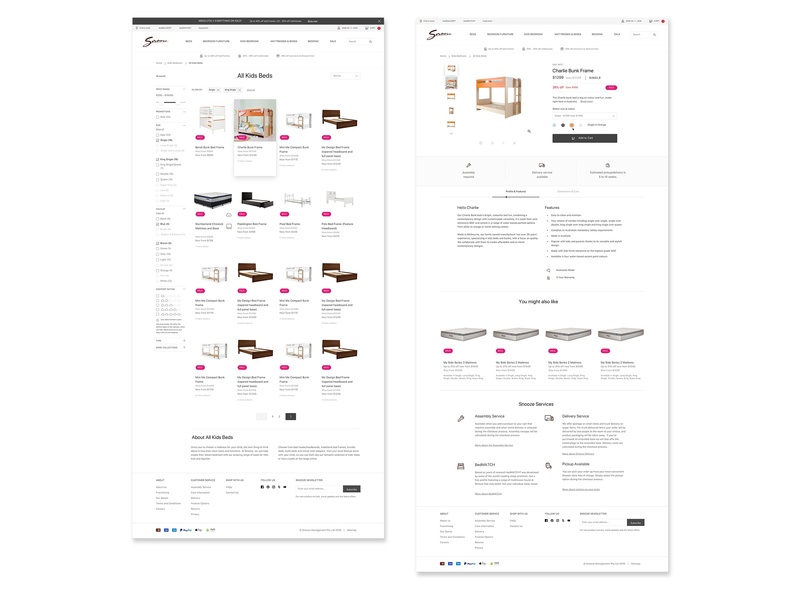 While a relative new comer to eCommerce, the furniture maker already had an understanding go the importance of their eCommerce store to every phase of the customer journey. We worked with them to make their online customer experience as helpful, easy and enjoyable as possible. The team at Snooze understands that retail is constantly evolving and as such, required a flexible and evolving eCommerce platform for the future. As part of our platform discovery, we found they were working on a custom legacy platform. It didn’t allow for the amount of nimble development required, or the desired ability to manage the site in house. This limited the business’ ability to test in market, move quickly for their customers and efficiently implement new features to improve their experiences. During Customer Discovery, we identified the core needs and principles that the online experience needed to meet in order to be successful for both customers and employees. 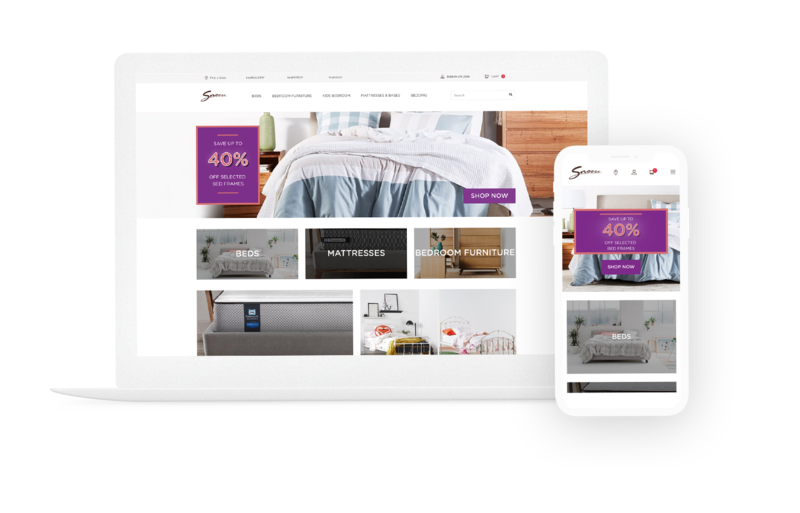 As a result, combined with our results from the Platform Discovery phase, we determined that Snooze needed to replatform their ecommerce site – without disruption to the business or their customers – as quickly as possible. This meant maintaining all current store procedures and downstream processes involved in their website. This was inclusive of the existing tech and other platforms such as the POS and PIMS systems. 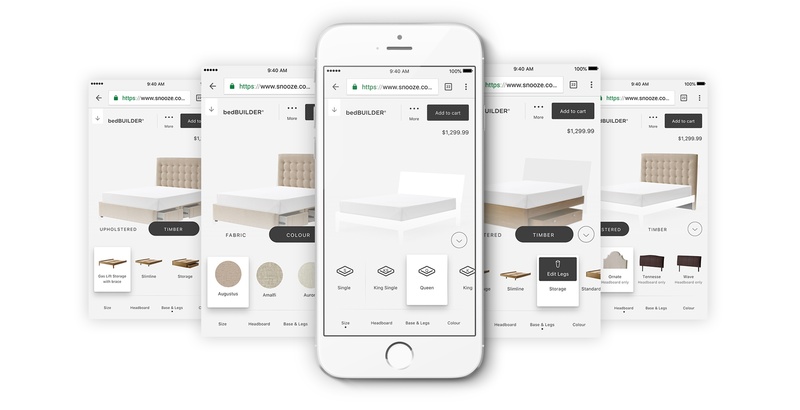 Concurrently, we found a Bed Builder platform that allows customers to design their own customised bed – including the size, headboard, base, material and colour – was a feature that would allow customers an enhanced ability to order custom furniture online. Although custom furniture makes up a large portion of the Snooze business, it was previously an inshore experience only. It was therefore jolting in the experience of a multichannel retailer, and to the customer moving between the brand’s channels. This along with the rest of the site required a mobile first thinking for the ease of use on a customer’s chosen device, as well as the flexibility and simplicity to allow the in house team to make their own site changes quickly and easily. Shopify Plus was chosen as a new eCommerce platform due to it’s nimble yet robust hosted solution. It has allowed the team at Snooze to simultaneously take their site management in house. It has also greatly improved their online shopping experience with major improvements made to the speed and user experience of their website. Snooze aims to create a world class, omni-channel retail experience to better serve customers across all phases of research, in-store investigation and buying. The newly launched Shopify Plus site features key new functionalities to achieve this, including a new payment platform featuring robust security and fraud checking, a new mobile friendly customised bed builder function, merchandised algorithmic search and the ability to offer free delivery, discounts and gift vouchers. This upgrade was completed in just 9 weeks and has since allowed for fast to market solutions and experiences to be provided to customers quickly and effectively. It has reduced friction across all channels and has assisted customers in their pre-purchase, purchase and post purchase phases alike, making for a more effortless and enjoyable customer experience.